What does it mean?! You're looking at a picture of the first fourth-order rainbow ever reported in nature. Just don't strain yourself looking for the other two bows; you won't be able to see them in this picture. And yet something about this photograph verifies that the two you can see are, without question, third-and-fourth-order rainbows, i.e. the second half of a quadruple rainbow. Can you guess what it is? If you can, it'll help you figure out where the other two rainbows are. Give up? Answers after the jump. Rainbows form when light is reflected to our eyes from inside falling raindrops. A single reflection inside the drop produces a bright primary rainbow, which appears on the opposite side of the sky from the sun. 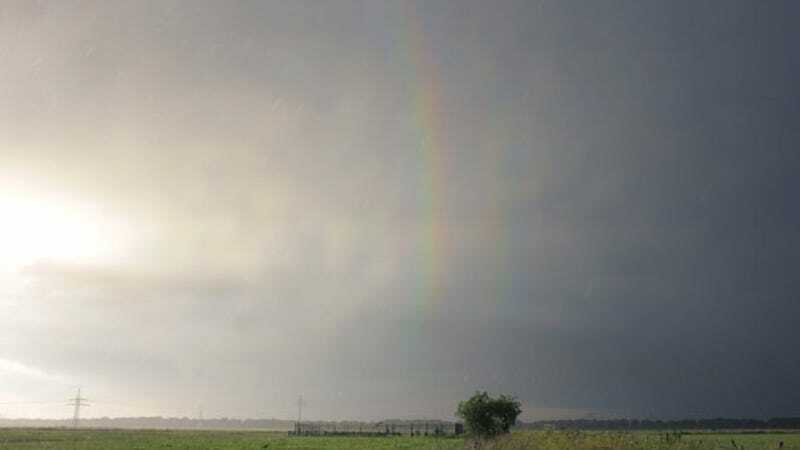 Two reflections inside the drop form the fainter secondary bow, which is outside the primary rainbow, but still on the same side of the sky, opposite the sun. Although very beautiful, such double rainbows are fairly common. By contrast, three reflections inside the drop produces the tertiary rainbow, which are much fainter and so rarely seen - and because those reflections take the light most of the way around the drop, it appears on the same side of the sky as the sun (this also makes it even harder to see). Four reflections produce the fourth-order rainbow, close to - but even fainter than - the tertiary rainbow. Because this photo is taken into the sun, it must be a third and fourth order rainbow - as Theusner reports [in the latest issue of Applied Optics]. In brief: Each extra reflection inside a raindrop produces a different rainbow. Each reflection dims the ray a little bit more, such that higher order rainbows not only become progressively fainter and difficult to see, they also switch what side of the sky you see them on (click here for another visual representation and explanation, courtesy of Atmospheric Optics, UK).